Hundreds of thousands of people turned out for the 44th Annual Boston Pops Fireworks Spectacular on Tuesday night. Boston will be holding their annual Boston Pops Fireworks Spectacular at the Esplanade. The concert on Tuesday will begin at 8 p.m. but no fireworks. On July 4th, the concert will start at 8 p.m. and will include performances by Rachel Platten, best known for “Fight Song”. Other guests who will be appearing are Indigo Girls, Rhiannon Giddens Natalie Cortez, and Rita Moreno. The fireworks begin at 10:30 p.m. Clickherefor more information. The city of Salem will be celebrating their Fourth of July with a bang at Salem Maritime National Historic Site on Derby Wharf. The festivities will start at 5 p.m. with music acts on stage and later at 7:15 p.m. a two-hour ‘POPs’ concert by the Hillyer Festival Orchestra, performing opera of Broadway favorites. Finally, at 9:15 p.m. the fireworks will set off accompanied with live music from the orchestra. Click here for more information. Six Flags New England, Agawam Six Flags is a lot of fun on July 4th as they celebrate their 4 day holiday with their Coca-Cola July 4th Fest. There will be exclusive ride times if you bring a Coke product, an All- American food fest, and fireworks will set off at 9:30 p.m. nightly. Afterward an after party! Click here for more information. In the town of Nantucket, the Department of Culture and Tourism will host Main Street activities at 10 a.m. At noon, there will be a water fight between Town of Nantucket’s Fire Department and the Boynton Lane Reserves. There is something for the kids filled with activities at 5 p.m. and at 6 p.m. there will be music on the platform. The fireworks will not go off on July 4 but on July 5, at 9 p.m. on Jetties Beach. Click here for more information. In Worcester, the fireworks will set on July 2 at 9:30 p.m., at Cristoforo Colombo Park (East Park) on Shrewsbury Street. At 4 p.m. there will be food, Kids Korner activities and a raising the flag to begin the festivities following the performance by the Massachusetts Symphony Orchestra. Click here for more information. North Adams will hold their annual fireworks show at the Joe Wolf Field. The SteepleCats game will start before the fireworks which will begin at 9:30 p.m. Click here for more information. Bay Pointe Waterfront Restaurant will be bringing fireworks in the City of Quincy in celebration of Independence Day and the restaurant’s 20th anniversary. The fireworks will be launching from a barge in town River Bay at 9:15 p.m. Click here for more information. In Fall River, the fireworks will be displayed from the decks of the battleship USS Massachusetts, starting at 9:30 p.m. The tickets are $10 per person to see the show. Click here for more information. The town of Marblehead will start at 9 p.m. the Harbor Illumination and then at 9:15 p.m. the fireworks will launch at the mouth of Marblehead Harbor. Click here for more information. In Lowell at 6 p.m. Edward A. LeLacheur Park opens and there will be a lot of activities a 7 p.m. The fireworks will start at 9 p.m. Click here for more information. The Old Sturbridge Village opens at 9:30 am is filled with Independence Day activities such as the reading of The Declaration of Independence, firing a cannon, and toy balloon fights. These activities will run on Monday and Tuesday as well. Click here for more information. In Lenox, the reading of the Declaration of Independence with the Shakespeare & Company starts at 1:30 p.m. Click here for more information. The city of Middleborough will be holding their Annual Carnival at Peirce Playground from July 3 to July 7. There will be games, rides and of course fireworks. Click here for more information. Plymouth will start off with their parade at 9:30 a.m., following their Waterfront concert at 7:30 p.m., and finally fireworks at 9:15 p.m. Click here for more information. Salisbury will be holding their celebrations at Salisbury beach with live music and fireworks at 10:15 p.m. Click herefor more information. Chelmsford will have a parade at 10 a.m. at McCarthy Middle School and a County Fair at the Common. Click here for more information. The Pittsfield Parade will start at 10 a.m. at the intersection of South and East and West Housatonic Click here for more information. Chatham 2018 parade’s theme is “Hooked on Chatham!” at 9:30 a.m. on the corner of Main Street and Shore Road. Click here for more information. Rockport’s celebration starts at 6 pm with their parade, then their concert at 8 p.m., and finally a Bonfire at Back beach at 9 p.m. Click here for more information. Bartnstable and Hyannis Parade, activities and 2K run starts off at Hyannisport beach at 9 a.m. The town will have their parade and village activities at 4 p.m. on Hyannis Main Street. Finally, fireworks will set off at 9 p.m. in Lewis Bay. Click here for more information. Edgartown parade starts at 5 p.m. at the intersection of West Tisbury Road and Pinehurst Road. Fireworks will be held at dusk on the harbor. Click here for more information. Sandwich starts their celebration with a fun run through the town around Henry T. Wing School, 33 Water Street at 8:30 a.m. and a parade starts at 10 a.m. The fireworks at later displayed at 10:00 p.m. over Shawme Pond. Click here for more information. The city of Everett will be celebrating on July 7th at Glendale Park from 4pm-9pm. There will be games, activities, musical acts leading to fireworks at 9 p.m. Click here for more information. Concord will hold their celebrations at Memorial Field Concord, there will be food vendors, a concert and fireworks at 9:15 p.m. Click here for more information. In Merrimack the festivities kick off on July 3 with their annual Holiday Concert at Abbie Griffin Park around 6:30 p.m. Afterwards on July 4th will there their annual parade at 1 pm marching at Commons Shopping Plaza and finally ending it with fireworks at 9 p.m. around Merrimack High School. Click here for more information. The town of Nashua will have their Motor Mania Holman Stadium on Main Street at 9 a.m., leading to a rock concert around 5:30 p.m. and finally at dusk fireworks will set off. Click here for more information. In Derry, there will be a fireworks show at the beginning of dusk. Click here for more information. A parade in Conway Village will start at 1:30 p.m. and more festivities later in Schouler Park such as music performances will be held. Finally, the fireworks will set off at 9:30 p.m. Click here for more information. The city of Portsmouth holds their annual fireworks celebration on July 3 at South Mill Pond starting at 9:15 p.m. Click here for more information. Providence's celebrations will begin at 7 p.m. in India Point Park. For those who come early there will be food and at 9:15 p.m. there will be fireworks while the Navy Band Northeast performs live. Click here for more information. Newport's fireworks display will begin around 9:15 p.m. in Newport Harbor. Click here for more information. The town of Warwick will celebrate the 4th pf July at Oakland Beach Seawall and the fireworks will start a 9 p.m. Click here for more information. In Narragansett, a beach party will be held at the Town Beach and then a magic show around 2 p.m. at the North Beach Clubhouse, fireworks will be displayed at dusk. Click here for more information. In Misquamicut, the fireworks will be at Misquamicut Beach, setting off at 9 p.m. Click here for more information. Block Island will have their annual fireworks display held at Town Beach Pavilion. There will be live music performing at 7:30 p.m. and fireworks will set off at around 9 p.m. Click here for more information. Portland's Stars and Stripes Spectacular is free and open to the public. The fireworks are set off at Eastern Promenade Park, starting at 9:20 p.m. Click here for more information. It is a day full of events at Boston Harbour, there will be Blueberry Pancake Breakfast at 6 a.m., a craft fair at 9 a.m. and a parade at 10 a.m. There are many more activities later in the day but the main event, the fireworks, are at 9:15 p.m. over Frenchman Bay. Click here for more information. The town of Ogunquit celebrates Independence Day with fireworks at 9:15 p.m. on Main Beach. Click here for more information. There will be Fourth of July fireworks at 9:45 p.m. in downtown Old Orchard Beach Click here for more information. Burlington has food, music and other entertainment will start at 5 p.m. and fireworks begin at 9:30 p.m. around Waterfront Park. Click here for more information. At Union Memorial School, Colchester will start with a 5K run at 7:30 a.m. and then the parade starts at 11 a.m. around Colchester High School. The fireworks display will take place at Bayside Softball Field around dusk. Click here for more information. 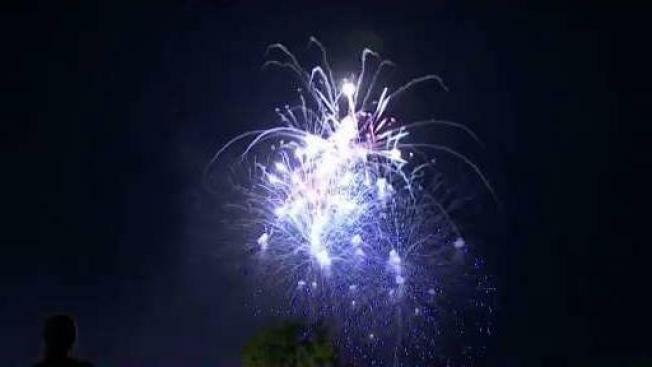 In Rutland, the Fireworks Extravaganza starts at 9:45 p.m. at Vermont State Fairgrounds. Click here for more information. In New Haven, the fireworks viewing will be at Wilbur Cross High School, music plays at 7 p.m. from WYBC and the fireworks start at 9 p.m. Click here for more information. In Middlebury, the Quassy Amusement and Waterpark will display “3-D” fireworks at 10:15 p.m. Click here for more information. On July 1, Waterbury will have food trucks and fireworks festival at Brass Mill Center. The fireworks start at dusk. Click here for more information. In the town of New London, the fireworks display will be at 8 p.m. on Ocean Beach Park on June 29. Clickhere for more information. The town of Norwalk starts their fireworks a 9:15 p.m. from Bayley Beach. Click here for more information.